The photo is scanned from the February 1989 edition of Schach Report, and shows them at the European Junior Chess Championships where they tied for first place. 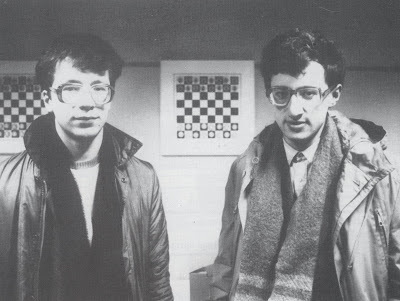 They both went on to become Super Grandmasters and compete in the candidates matches. Can you name them? I've had email suggesting Kamsky as well, but it is not him. You are correct about Gelfand though. Good luck getting the second player. I'll have a guess (not that I know enough about chess to guess) - Gennadij Timoscenko. I've had a couple of emailers who guessed the other player correctly (although one was at the second attempt). I'll give you all another 24 hours before publishing the answer.